Appalachian State was tabbed as the No. 8 team among the college football’s “Group of Five” conferences and independent programs (excluding Notre Dame) by SB Nation. Appalachian State University football was tabbed as the No. 8 team among the NCAA Division I FBS “Group of Five” conferences and independent programs (excluding Notre Dame) in an SB Nation article on Friday. In the article, national college football writer Bill Connelly groups Appalachian State among 15 “definite conference title contenders.” At No. 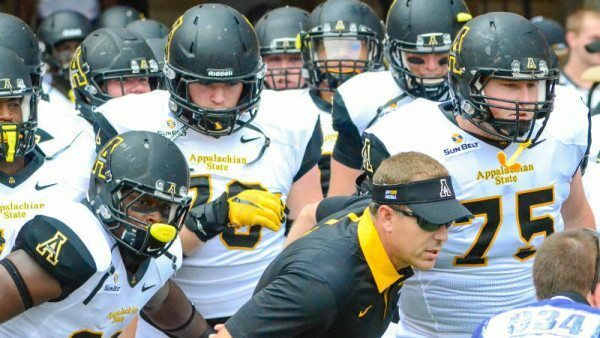 8 in the overall rankings, App State is the highest-rated Sun Belt Conference program. The Mountaineers came in behind only Houston, Boise State, BYU, San Diego State, South Florida, Western Kentucky and Western Michigan. Georgia Southern (No. 11), Arkansas State (No. 20), Troy (No. 35), Georgia State (No. 36), UL Lafayette (No. 43), Idaho (No. 47), South Alabama (No. 51), New Mexico State (No. 55), Texas State (No. 59) and UL Monroe (No. 61) rounded out Sun Belt programs in the rankings. Other notable teams included 2016 opponents Akron (No. 29) and Old Dominion (No. 48) and in-state rivals East Carolina (No. 25) and Charlotte (No. 60). Appalachian State went 11-2 and won the Raycom Media Camellia Bowl in 2015. The Mountaineers’ 11 wins were a Sun Belt record. App State also became the first team to ever win 11 games in its first full-fledged FBS season. Season tickets for Appalachian State’s much-anticipated 2016 campaign are on sale now and can be purchased online atappstatesports.com/tickets and by phone at (828) 262-2079. Earlier this week, App State announced that 2016 season-ticket sales have already surpassed the amount sold in 2015. Due to the brisk sales, tickets in four sections of Kidd Brewer Stadium are already sold out. GIBBS RECOGNIZED AMONG “FIVE G5 PLAYERS TO KNOW” BY ATHLON: Appalachian State earned additional recognition among its Group of Five peers earlier this week when defensive back Latrell Gibbs (Kennesaw, Ga./North Cobb) was named one of five “Group of Five Players to Know for 2016” by Athlon. A first-team all-Sun Belt selection in 2015, Gibbs led the conference and ranked seventh nationally with seven interceptions as a sophomore last season. He returned a pickoff 91 yards for a touchdown to spark App State’s Oct. 3 win over Wyoming and had a pivotal interception in the Mountaineers’ 31-28 Camellia Bowl triumph over Ohio. He also broke up 12 passes during his brilliant sophomore campaign. Gibbs is joined on Athlon author Lance Dozier’s list by Southern Miss quarterback Nick Mullens, San Diego State running back Donnel Pumphrey, Houston linebacker Steven Taylor and Western Kentucky wide receiver Taywan Taylor.